Let’s talk holiday attire… St. Patrick’s holiday attire that is! Sure, you could wear a green T-shirt that you found buried in the back of your closet, but what’s the fun in that? 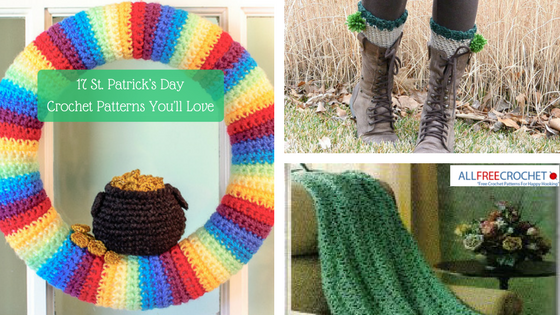 With St. Patrick’s Day crochet patterns , you can take the wearin’ of the green to the next level while adding style and flair to your outfit. Select your favorite yarn in a bright shade of green and get to work on hats, shawls, boot cuffs, and other cute items for your entire family to wear on March 17. Creating something that is for one-time use doesn’t need to break the bank. It’s likely you can find the yarn needed for the project tucked away in your yarn stash! We at AllFreeCrochet  have compiled a list of St. Patrick’s Day crochet patterns that everyone in your family will love. You’ll be the best-dressed person at your local parade or party when you make these patterns. Lucky Green Necklace  — Your St. Patrick’s Day ensemble won’t be complete without this necklace! Lucky Springtime Crochet Shawl  — So elegant! Leprechaun Dog Hat  — Even Fido can join in the fun! Celtic Crochet Afghan  — Love the intricate design! Pot of Gold Wreath  — You’ll always have good luck with this cute wreath! You can also choose your favorite crochet messy bun hat pattern  to make to keep you warm during the annual parade! Just choose festive green shades and you’ll be all set!